If you're trying to save some cash on beauty extras, but still want a sophisticated, polished look for your nails, you can start giving yourself French manicures at home and save the salon cost. 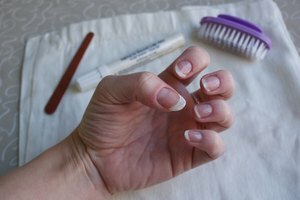 The tricky part of the classic French manicure, with its white tips and pale pink base, is getting the white ends of your nails painted precisely. You can make your own guide strips at home for a fraction of the cost of a trip to the nail salon. Use sharp scissors to cut 10 thin strips from the electrical tape. Keep the strips no shorter than 1 inch. Electrical tape is flexible, sticks well and doesn't leave a glue residue on your nails. Stick one end of each strip to your work surface. Leave one end loose so you can easily grasp the the strip. Apply a layer of base coat to clean and filed nails. Allow it to dry. Apply a coat of your neutral color polish on top of the base. Allow it to dry. Lift one of the tape strips off the work surface. Affix it to your nail. The portion above the strip will be painted white, so place the strip as high or low as you'd like to achieve this look. Apply the strips to the rest of the nails in this manner. Apply white nail polish to the area above the tape strip. Remove the strip after painting, taking care not to smudge the wet paint. Repeat this for the rest of your nails. Allow the white paint time to dry thoroughly. Apply the top coat to the entire nail after the white section is completely dry. 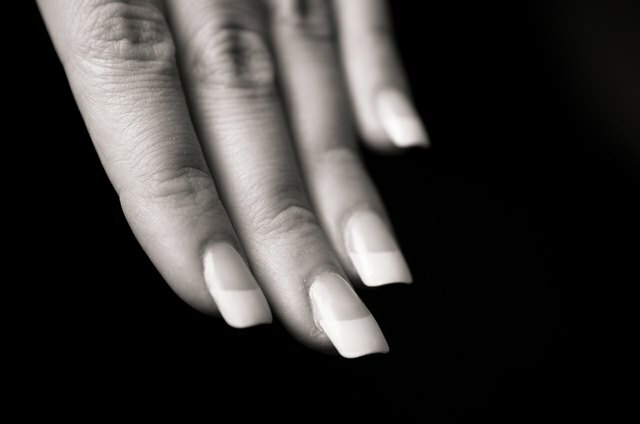 Let the top coat dry completely to finish your French manicure.